The Vienna Commercial Court received a lawsuit against SK Rapid. The football club is sued by Strabag, general contractor of Allianz Stadion. The building was contracted for € 53 million, but now Strabag insist the actual cost was higher. The difference is € 2.757,960. The construction company hasn’t commented on the case as of yesterday, but Rapid remain calm. The club ascertain that Strabag should bear the additional cost, having previously agreed to receive €53 million for the job. 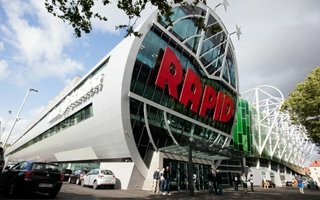 “It’s not unusual for such construction projects to have disputes of this kind”, said Rapid’s managing director Michael Peschek. The case may be somewhat problematic, because the two entities have personal connections. Raid president Michael Krammer’s brother is on the board of Strabag. Earlier this year Rapid issued a request to Strabag, asking the contractor to re-lay the turf at Allianz Stadion, following the last event of the season (Aida show in June). The operation is estimated to cost € 150,000, but Strabag hasn’t agreed to the request as of now.